You are amazing! One of the things that annoys a lot of game developers is finding great art, but there isn't enough to make a game. For example, finding a cool character, but no terrain. You are making everything I can think of that might be included in a roguelike! 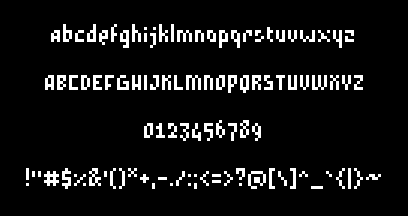 Characters, monsters, bosses, and now even a custom font! This is all so great! Keep up the good work! Thanks Ryland, I have a somewhat patchy record finishing projects so your encouragement makes a big difference. It might take me another year, but if I keep going I think I'll be able to make this tileset into something pretty epic. "Grumpy wizards make toxic brew for the evil Queen and Jack." I guess 'wizard' in general is a great word for pangrams. I'm going to try to get this up in a quick FontStruct font (see http://fontstruct.com/ , it's free and wonderful for creating pixel fonts); it should be very easy since you did all the hard work! I will release it under the most permissive license FontStruct allows. Well, that was fast. http://fontstruct.com/fontstructions/show/619766 has a slightly modified version of your font! You can use it at size 6 or 8 to get it pixel-perfect (it depends on your rendering engine; for example, most Windows native applications use size 6, while Adobe products and Java Swing applications use size 8). The page lists the modified letters, but the important thing is that the max width is now 5 (before, the @ was 6 pixels across). Enjoy!